This is the kind of book that I would probably never have even have heard of were it not for my university courses. And of all my books, this one had one of the more intriguing premises. So how did it hold up? So, to the premise. It's Mussolini's Italy, around 1937 to be precise, and in the Via Merulana in Rome, there have been two crimes in the same apartment building in quick succession. The first is a robbery in which a widowed Countess is robbed of her jewellery, while the second is the brutal murder of a young married woman. The main character, Doctor Ingravello (also known as Don Ciccio), who is investigating these crimes with the police was a secret admirer of the murdered woman, as well as friends with her husband, so he is particularly keen to find the culprit. At the same time, the book aims to portray and criticise Mussolini's Italy. Sounds like a great premise, right? Well, That Awful Mess on the Via Merulana doesn't really live up to it. As a mystery novel, it leaves much to be desired. Mainly because neither plot thread has an ending. The robbery plot thread is more closed, as the jewels are found, but otherwise the reader is left with a feeling of incompleteness as neither story feels like it was given adequate attention. The other thing that left the mystery fan in me cold was that there is only ever one possibility that the plots follow; there is never any sense of tension because the author only ever gives us one suspect to consider at any one moment, presenting no other alternatives. It says on the blurb that Ingravello finds that everyone in the apartment block comes under suspicion, but this is an out and out lie; there is a grand total of one other person in the building who comes under suspicion, the rest being outsiders who have had dealings with the building in the past. I just feel that the mystery novel aspect, which is the one advertised on the back, is poorly developed and more meant to be a vehicle for the social commentary. There's a lot of social commentary. Social commentary on a society that had died out about 11 years before the book was published. Social commentary that cannot get to the point. You see, Gadda wraps up most of his social commentary in LOADS of symbolism and metaphor, to the point where a lot of what he's saying is completely lost; as far as I could tell from the translator's note, this was due to timidness and not wanting to offend people. So he wrote what was meant to be criticism of a long dead regime in Italian history and he muddles it so as to not offend people. One, who in their right mind defends Mussolini of all people? 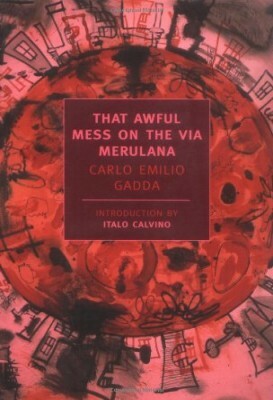 Two, how much of that regime remained to be offended by Gadda's criticisms? I just fail to see the point of loading your book with what I imagine to be witty commentary in its original form, only to then change it so that no-one understands it. It's especially frustrating, as the writing is evidently very good; granted, the translation apparently loses some of the original flavour due to the inability for people to translate dialects, but what makes it through is promising stuff.